Last week when I decided to cook this dish, I planned to write a silly little post about the pot holes in Montreal, or “nids de poules” as they are called in French (chickens nests). But then Japan happened. Seeing all the devastation caused by the earthquake and tsunami made writing about a few bumps in the road seem so petty. People around the world are looking for ways to help. The easiest thing to do is to make a donation to a non-profit that is helping in the area. Which non-profit to donate to is always a tough call. The safe choices like The Red Cross have high overhead costs, and the smaller organizations may not be legitamite. Because of their reputation, I choose to donate to organizations like The Red Cross or Medecins Sans Frontieres (Doctors Without Borders); they may have more overhead but they are trusted, well known organizations. If you are looking for another way to help, Sabrina from The Tomato Tart is hosting an Online Bake Sale to help Japan. Check out her post if you want to donate goods or bid. If you simply want to donate, here are a few links. Clean and pat dry the chicken legs. In a large bowl, toss the chicken with the onion, garlic cloves, bell pepper and potatoes with oil so that everything is coated. Season with salt, pepper and thyme. Place the vegetables on a large baking sheet in an even layer. Place the chicken legs on top of the vegetables. Bake for 40-50 minutes, until the chicken is cooked through. Remove the chicken and vegetables from the pan. Place the pan on a burner on high, pour the wine into the pan and deglaze (scrape up all the brown bits). 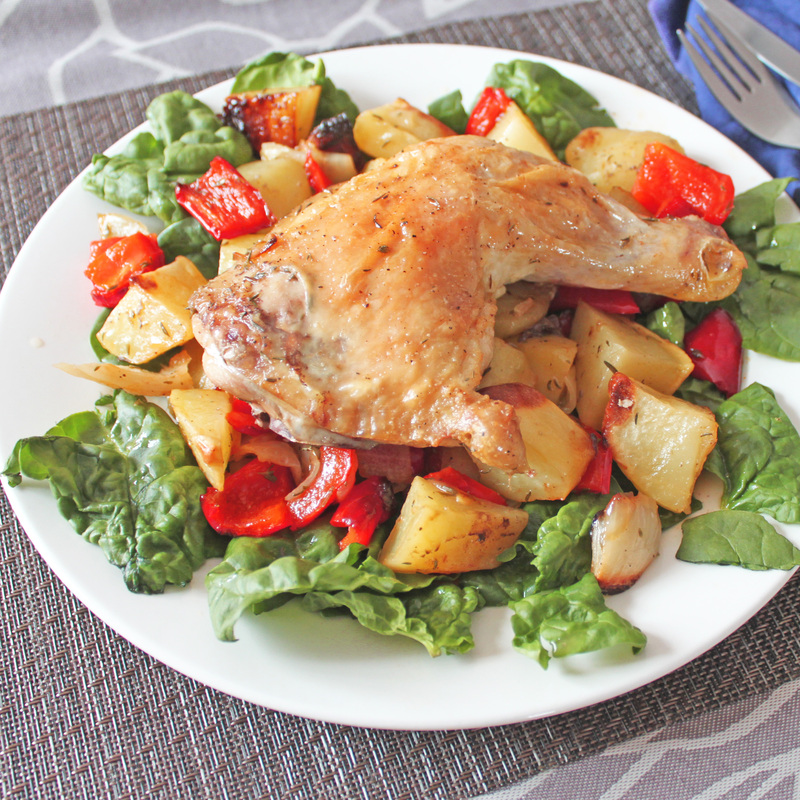 Place the chicken and vegetables on a bed of spinach and top with the wine sauce. Great post Lynn. The events in Japan have been so devastating. Nice to see the blogger community coming together to help. I love your salad and would enjoy it as a healthy and very satisfying dinner. I agree the events in Japan are horrible to see and difficult to comprehend. I appreciate your call to help by donating goods or money to Japan. Kind of puts thing in perspective for all the rest of us. So horrible what is happening in Japan. Thanks for sharing all these links. Also, your recipe sound healthy and super easy for a weekday night. thnks for the links,..chicken looks delicious.. Thank you for a lovely post, Lynn. What’s happening in Japan right now is so scary and they need us all so much. I still would love it if sometime you posted about the chicken nests, I think that’s an adorable name for potholes! And very fitting with your chicken recipe. I think a lot of us are struggling with writing about food in light of what is happening in Japan. Lovely post, and great recipe! Totally want to go make that now. If only I had the right ingredients!